Face it: we live in a digital world. The days of using a tangible map and compass to navigate our way on trail have fallen by the wayside like 8-track tapes did in the 80s. For some adventurers, now it’s all about using the best available technology. 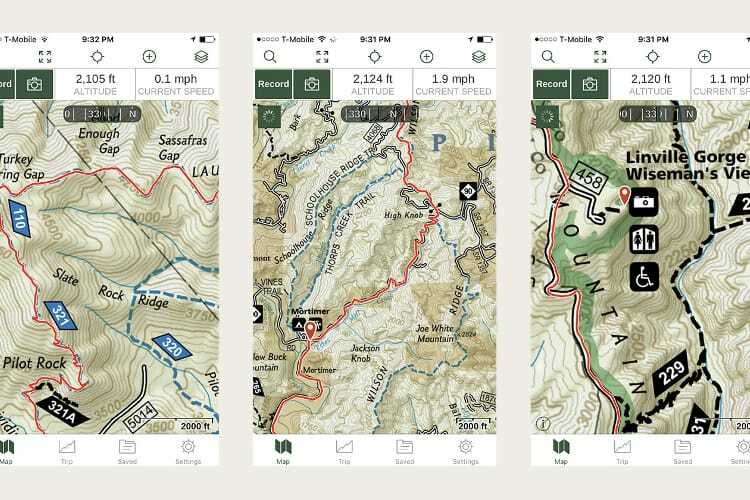 And when it comes to the best app for the trail, there are two names which reign supreme: AllTrails and Gaia GPS. AllTrails and Gaia came upon the scene around the same time — 2010 and 2009 respectively. Since then, each has built a reputation as a mobile-GPS force to be reckoned with. 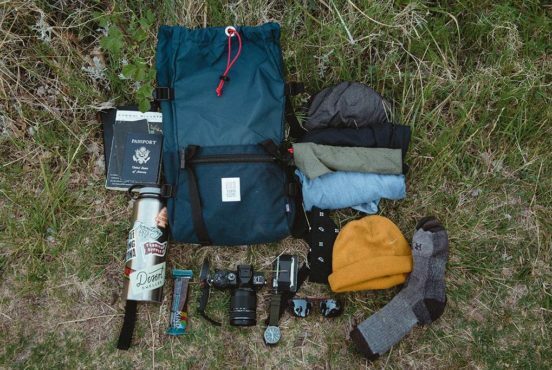 Mention either by name and you’ll be greeted by an onslaught of dedicated outdoor enthusiasts that swear by one or the other. I for one have my own preference, or at least I thought so. My partner and I have been collecting tracks of our hiking and off-road adventures since we met. And while we use one app in particular to do so, I was curious as to whether or not there was a reason to ditch our preferred app of choice for the other. 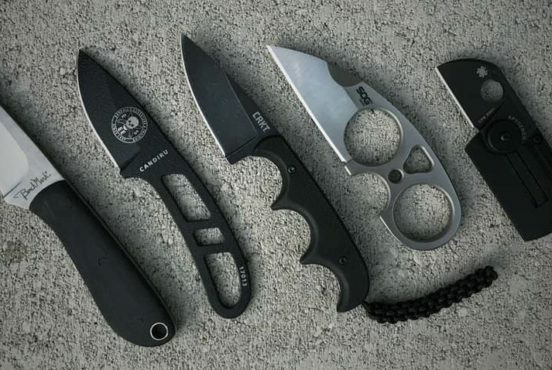 So being the gear junkie that I am, I put the two up against one another to see how they ranked. 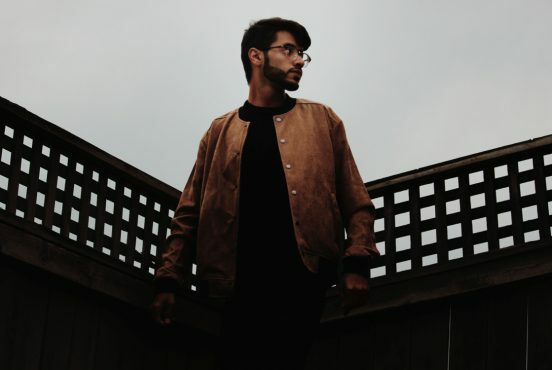 After some extensive research and miles, I found some interesting results that will help you to determine which app is right for you. AllTrails is your free guide to outdoor recreation. 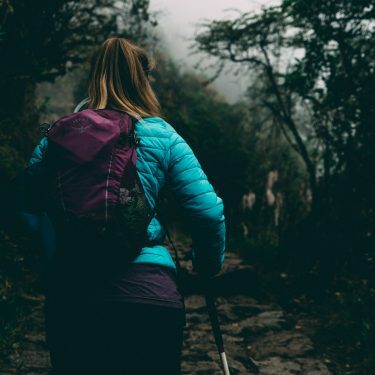 It boasts a list of over 60,000 trails in its database and is used by more than 10 million outdoor enthusiasts each year. Upon opening the app, you’ll be greeted by a list of nearby hiking, biking, and running trails. Scroll through and you’ll find plenty of trail options, each categorized by difficulty level as well as user ratings. 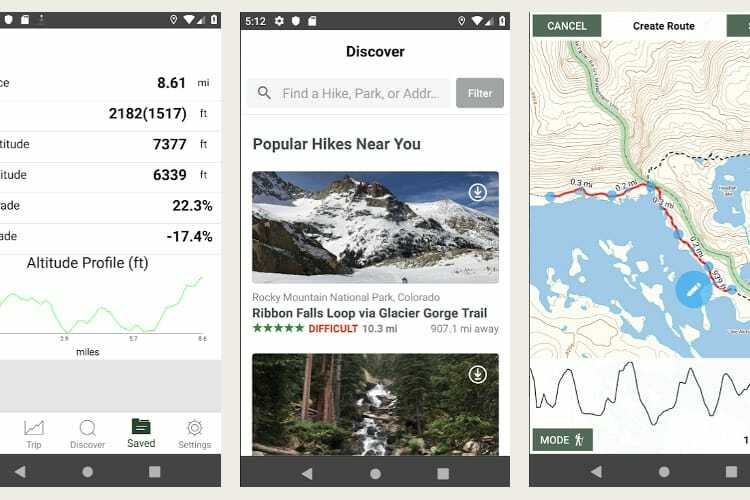 Tap on one and you’ll find a short description of the trail along with distance, elevation gain, a full trail map, user reviews, and weather icon. Once you find a trail you like, you can select the heart icon to save it to your “plan” list. If you happen to be looking for a hike in a specific area, you can search by city, park, or trail name. There is also a filter option to better tailor the results to your liking. Once on trail, AllTrails can be used as a GPS navigation device. 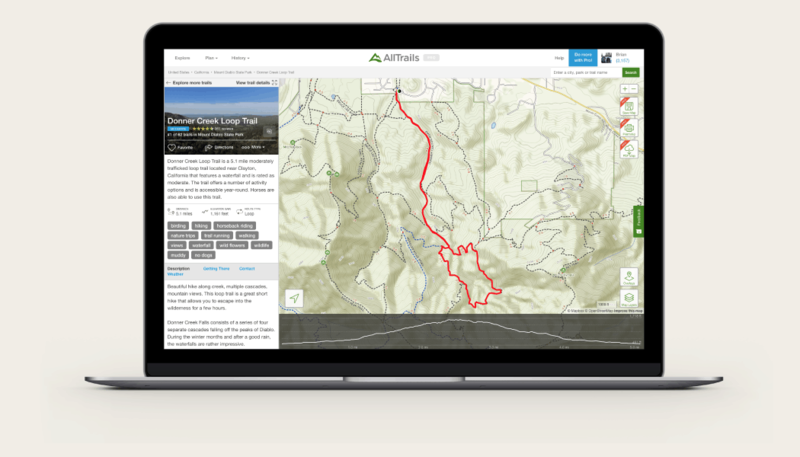 Use the map to guide your way with one of the three-layer options: AllTrails, road, or satellite. 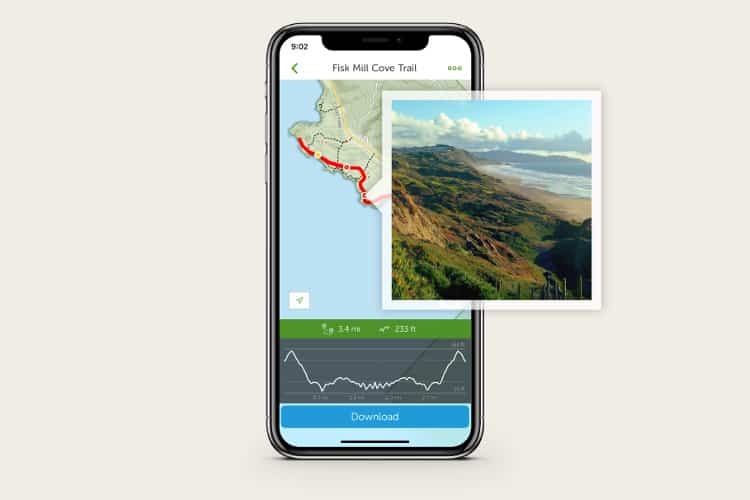 At your fingertips you’ll find data of your current time, distance, and elevation with the option of adding waypoints and photos along the way. Record your track and easily share it with other users and friends upon completion. For $2.50 per month, $69.99 for three years, or $100 a lifetime, you can go Pro. This gives you access to even more features which include five premium map layers, four real-time map overlays, downloaded maps for offline use as well as printing, custom designed maps, and a detailed Lifeline tracker for safety. Gaia GPS instantly turns any smartphone into a useful navigation device. 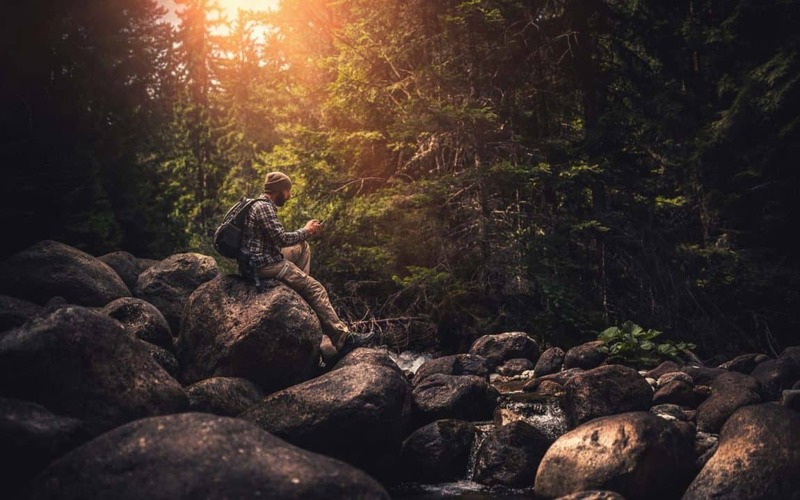 Designed for hiking, hunting, and off-road explorations, Gaia is the app to plan, guide, and share your next outdoor journey. This information-dense app comes equipped with an impressive amount of features. Like AllTrails, it offers an extensive list of trails to search through with the difficulty levels, popularity, distance, time, and ascent included. 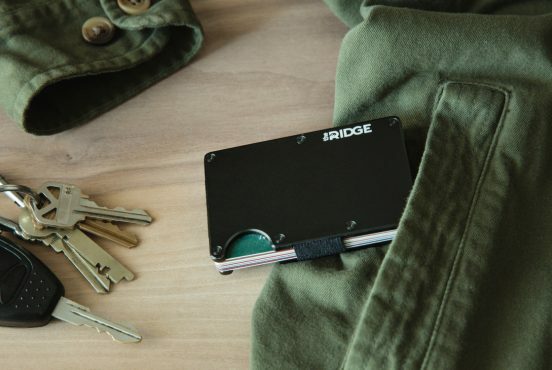 It too can record, track, share, save, and add waypoints and photos to your trip. And yes, it also includes the time and distance of your trip. What sets it apart, other than the visual layout of course, is the technical details. For example, Gaia will not only tell you your current speed, but it will tell you your average speed, moving speed, max speed, and pace. To enhance the navigating experience, Gaia offers a free default topo map for a more accurate climb in elevation and exact route. The app offers your current latitude and longitude when in tracking mode and can easily be used when you’re out of cell range to help guide your way. There’s also a compass tracking your movement as well as a nifty tracking arrow showing the direction you are heading. If you find yourself wanting to make the most Gaia has to offer, you can purchase a Membership or unlock even more features with a Premium Membership. Membership will run you $20 per year and includes USGS topo, Mapbox Satellite, offline map downloads, map printing, NPS maps, and access to over 50 base maps worldwide. Meanwhile, Premium Membership costs $40 per year and will give you access to 250 plus maps and overlays. This includes ESRI world imagery, National Geographic Trails Illustrated, Backroad Mapbooks Canada, NeoTreks US Topo, SwissTopo, and public and private land overlays. You’ll also have the ability to stack maps if you so choose. AllTrails: Is it Worth it? Searching for reviews online, you’ll find plenty of users that have positive feedback for AllTrails both on Apple and Android devices. The user-friendly interface and extensive catalog have gained AllTrails a world of praise from Apple and Android users alike. However, like all things in the technological world, it still has some kinks. Gaia: Is it Worth it? 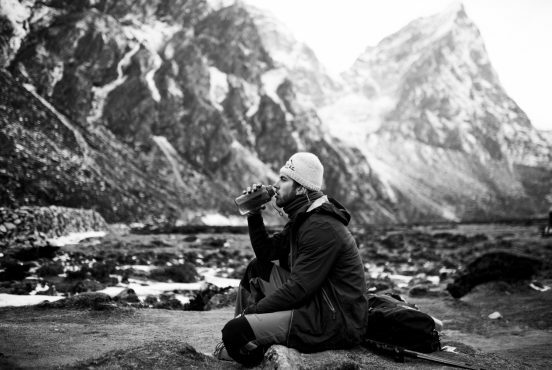 Backcountry enthusiasts will tell you Gaia is the app of choice. Between the navigation, maps, and layers, it’s one of the most used apps in this community. However, not all Android users have experienced the same luck. Several users have indicated issues with some of the features, leading one to assume this app works best with Apple. This could be due to the fact that when Gaia was first introduced it was only available on iOS. However, it does appear to be something Gaia is aware of and working on. In fact, they are specifically asking Android users to beta test their new updates so if you’re an interested Android user, head on over to their website. Upon first glance, AllTrails had me sold. The app is the epitome of user-friendly. Scrolling through trail options is a breeze and recording is a synch. I particularly appreciate the user ratings and difficulty level listed on the trail thumbnails, along with the filtering option. I often find myself in unfamiliar territory and this lets me find a trail in no time. Whether I’m trail running or day hiking, this app has proven to be on point. It’s easy to navigate the trail and provides all the basic info you would want along the way. I often find that too much data can get messy and make apps more complicated than necessary. This isn’t the case with AllTrails. It has a clean design and simple features which streamline the searching, recording, and sharing process making it incredibly attractive. If I’m searching for a hike in a new area or doing a relatively short hike, I find the free version meets all my expectations. The one major factor supporting the argument for upgrading is AllTrails now offers Lifeline. As one who likes to solo hike and trail run, this gives me peace of mind knowing my contacts are aware of my whereabouts. All in all, this is a solid app that even the most technologically illiterate could figure out how to use. Gaia comes with its own advantages. My partner and I do plenty of off-roading, and more often than not, find ourselves taking some pretty rough roads to get to remote trailheads. Gaia is there to help every step of the way. From road to trail, Gaia has proven to be impressive. The GPS accuracy, amount of live data, layers, detailed maps, and customizable features put it in a league of its own. I find the satellite feature is a much needed tool when navigating back roads while the topo map makes it an exceptional field guide. I’m especially impressed with all the information it has about speed. 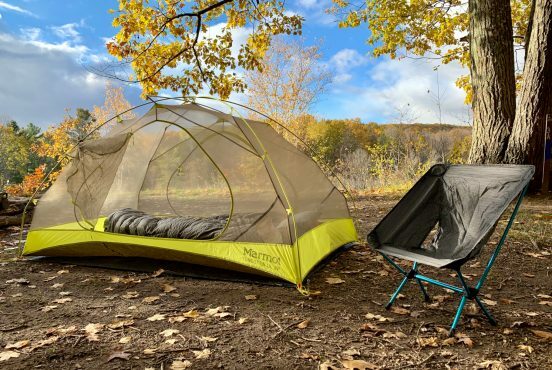 This can especially come in handy if you’re thru-hiking and need to meet your daily mileage. While I do tend to consult a GreenTrails map before heading out on trail, I can’t always get my hands on one before heading out. This is when the map downloading and printing options come in handy, as well as importing KML and GPX files. I should also mention it lets you synchronize information across all your platforms. The maps themselves are a major factor when choosing Gaia. 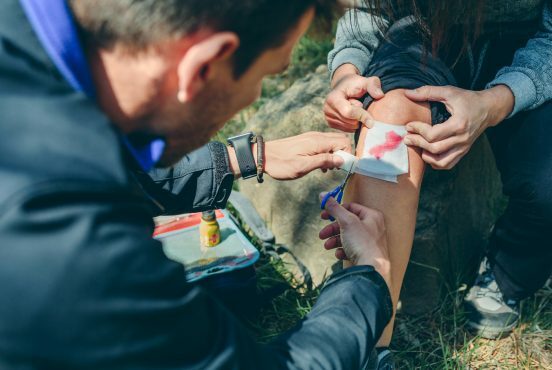 Rather than crowdsourcing trail info that can often be misleading, they rely on surveyed data, and tons of it. 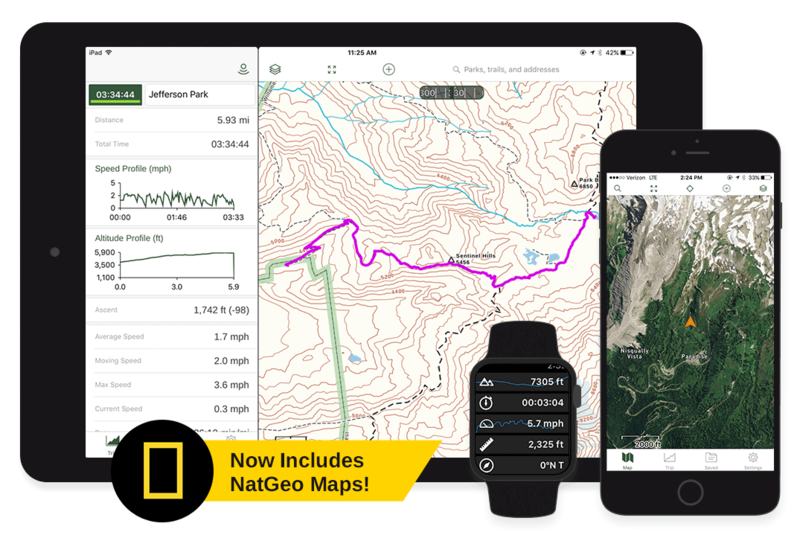 The ability to use trustworthy maps such as the ever-popular Nat Geo’s Trails Illustrated makes navigating that much more accurate. I also really appreciate their beta testing. 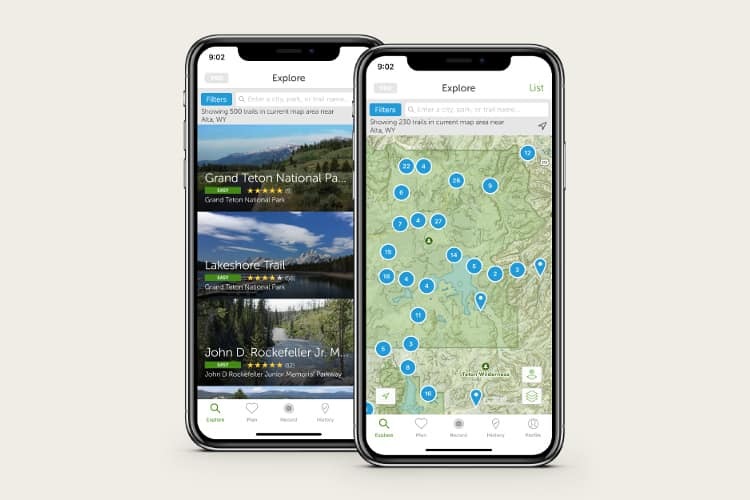 When Gaia launched their new updated version, they relied on the expertise of 80 field testers ranging from professional outdoor guides to hunters to improve the app. 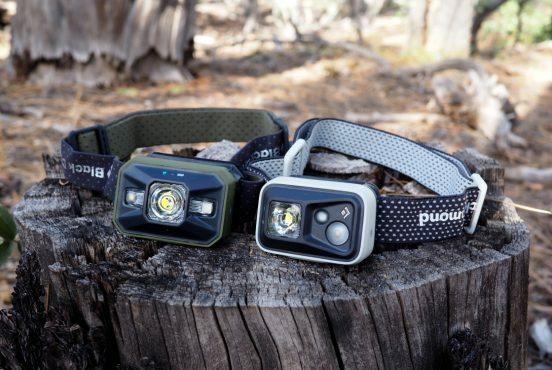 With all its features, it’s easy to see why this is the top choice for backcountry exploration and mountaineering. The first thing I noticed is not all trails are listed. While I don’t expect the app to have every single trail imaginable, I was rather surprised by this. There are some highly trafficked state parks in my area and the search engine failed to show many of them in the results. Also, because the trails are crowdsourced there is more room for error. This can easily result in misleading information causing problems when navigating the selected trail. Perhaps there could be more trail-sourcing and fact-checking. User to user communication, if one so chooses, could also come in handy in this situation. The most apparent drawback I found was the limitations of the app itself. Even when paying for a Pro membership, when compared to Gaia it didn’t offer nearly the same amount of features. There’s also the issue of trailhead locations. Where the trailhead starts in relation to yourself isn’t always clear. Once on trail, it’s also best to go into offline mode if possible, otherwise you’ll quickly find yourself with a dead phone battery. Gaia was first made for iOS which is great for Apple users and not so great for everyone else. There have been reported issues on other platforms which is a major drawback. For some, this app can take some getting used to. Gaia has a plethora of features and there is a learning curve when using it to its full potential. Like AllTrails, it also significantly drains battery life. I found a three-mile hike left my battery almost dead. There’s also the issue that the compass will not work when driving. Another kicker is the price. Not everyone is so willing to fork out $40 a year for an app when they can pay a one time fee for a handheld navigation GPS device. Offering a lifetime fee options would be more worth it in this case. Now that we’ve put the two through the wringer, which one will you choose? There’s no right or wrong here. Each app serves its own set of purposes that may not the right fit for everybody. For instance, if all you plan to use the app for is searching and recording trails to share, I say go with AllTrails. It has all the functions you need for free. Day hiker or short distance trail runner? I’d also recommend sticking with AllTrails. For anyone wanting the extra security of others knowing your location, AllTrails is once again the option for you. And all those who don’t care for extra specs or aren’t technologically inclined, go with AllTrails. For mountaineering, hunting, off-roading, or anything backcountry I would go with Gaia. It has more powerful navigation capabilities and a ridiculous amount of features you’ll find come in handy when you really need to know exactly where you are. If in doubt, you can always download them both for free and take them for a spin yourself.